This article gives you complete details about the Velodrome which is decided to be the venue for track cycling for 2012 London Olympics. More details about the events conducted, location of the venue etc are quoted in this article. Velodrome is decided to be the venue for track cycling event for 2012 London Olympics. There will be 28 events conducted in Velodrome venue. Velodrome venue is located in the north of the Olympic Park. The construction of Velodrome venue started in 2008 and completed in February 2011. The venue is designed beautifully with more natural lighting inside the stadium and no need of any electric lighting. There will be 3500 seats available for spectators to watch the Olympic events. More details about the events conducted in the venue, location of the venue, construction period etc is given below. 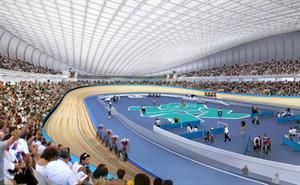 How to reach Velodrome venue for 2012 London Olympics? Velodrome is located in Olympic park. You can reach Olympic park through rail, bus routes, private vehicles and taxis. Three national railway stations are available to reach Olympic park which includes Stratford station, Stratford International station and West Ham station. You can also use London Undergrounds which are located in Jubilee and Central lines, and West Ham on the District and Hammersmith & City lines. Buses are also available at major places and stops.